We used to have a number of strong international chess tournaments in the UK including Hastings, Philips and Drew, and Lloyds Bank. Now, sadly, only Hastings and the 'island' tournaments remain: strong opens in early autumn on Guernsey and particularly the event on the Isle of Man. 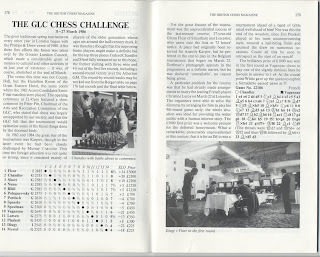 One tournament, from the good old days, that has always stuck in my mind was the GLC Chess Challenge in 1986; I was delighted when I discovered, in my attic, an old copy of British Chess Magazine covering the event. The GLC Chess Challenge was remarkable for the performance of Glenn Flear. Glenn was an IM at the time and the second lowest rated player in the tournament. He was also not supposed to be playing; he only got his place when Anatoly Karpov withdrew at the last moment. Despite this, Glenn managed to win the tournament ahead of such great players as Boris Spassky, Nigel Short, Lajos Portisch,Pinter Ribli, Lev Polugayevsky, Bent Larsen, John Nunn, Jon Speelman and top seed Rafael Vaganian. There was great human interest, because Glenn got married during the tournament to a leading French player. The 9th round was played early to allow him to attend the ceremony! British Chess Magazine dubbed his feat as unprecedented in the 20th Century (the tournament victory not the marriage I believe), saying the only comparable achievement was Harry Pillsbury's at London in 1896. We'll dig out some of Glenn's games for a future article.